Starting GPS Co-ordinates: N51 14' 90" W000 37' 60"
Finishing GPS Co-ordinates: N51 14' 20" W000 39' 80"
Annoyingly, this byway starts on a completely different OS map, namely OS Explorer 146 'Dorking, Box Hill & Reigate'. It starts as a concreted UCR leaving Mole Street to the west, serving as the driveway for a couple of cottages as well as Holdenbrook, Pisley and Fishfold Farms. Back on OS Explorer 134 The greenlane winds its way through some pleasant woodland called (funnily enough) Pisley Copse and then is re-designated as a BOAT on passing Fishfold Farm, although it continues to be concreted. As the driveway to Holdenbrook Farm divereges to the north west, the lane itself turns to the left and the concrete turns into leaf mould and mud. This trail is in good condition: the majority of the vegetation has been cut back and for the most part the surface is unrutted and easy going, even in very wet weather. The junction between Pisley Lane and Green Lane. Speaking of water, and why this lane scores so highly, is that from Holdenbrook Farm the lane begins a slow descent downhill until it meets Holden Brook where it fords this extremely pleasant stream. A footbridge crosses the river on the southern side of the ford and on a summer's day this would be a great place for a picnic and a paddle. 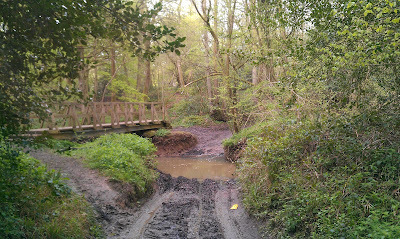 However, for the purposes of greenlaning, the ford is usually pretty shallow (although the trail biker in the video embeded below obviously picked the wrong day to try to ford it! Let that serve as a warning to all.) and has a bottom of fine gravel that seems to be more than capable of supporting a 4x4, and we got through it with no trouble. Needless to say, it is highly advisable for you to check the depth of the water and condition of it's surface before you go piling in, and if you get stuck it's not our fault! Climbing out onto the far bank, the lane turns slightly to the west and then takes a more or less straight track until the byway finishes on Horsham Road. 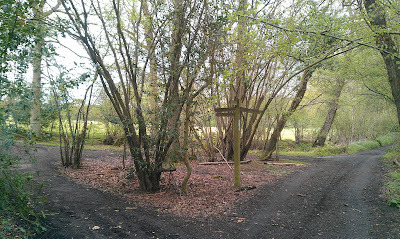 A far better option to continue greenlaning is to take the turning to the south (at TQ124394, see picture above) down another, similar, BOAT called Green Lane. One final note: Pisley Lane carries on for a very short distance as a UCR over the other side of Horsham Road, but since it's a dead end it is entirely pointless driving it. 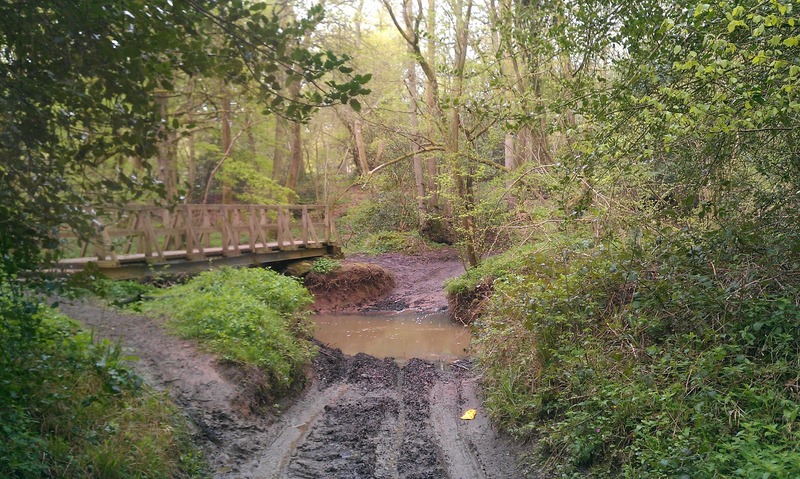 This is Surrey County Council's Abinger Byway 542.